These are the modified jinc2 shaders. I would like @hunterk to take a look at them. Thanks. That screenshot looks cool, I’m amazed you got jinc2-sharper to actually blend the checkerboard pattern I’ve never seen it accomplish that. 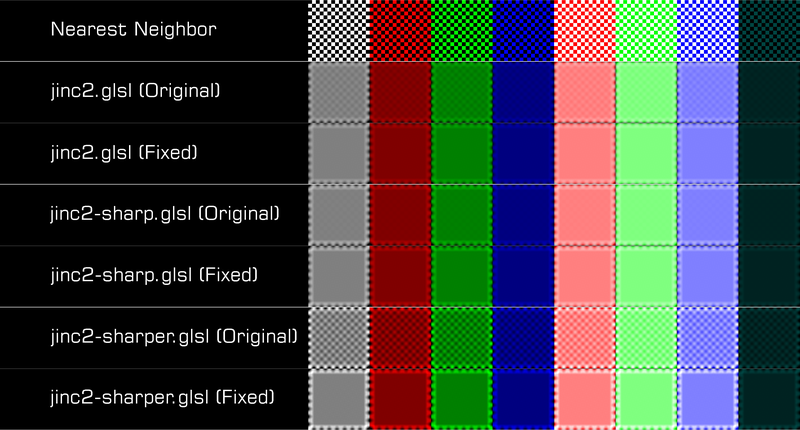 That definitely handles dithering better, but does it affect the quality of the filtering in other ways? @hunterk I’m not sure, but zoom in and compare the outer edge of the pattern. It seems like there’s some difference, but I’m currently viewing from my phone. EDIT: I think these are worth adding as separate shaders if need be. There are small differences here and there as logical, but they have seemingly equal sharpness overall. Be sure to open the pictures as sometimes they get cut off.